Let me start by saying that Naruto chapter 583 is a full chapter of flashbacks, though thankfully they all contain new material, that being more of Kabuto’s past / backstory. I said last week that I wanted more action, and while that hasn’t changed, on this occasion I am not going to complain about not getting what I was hoping for. In fact, this is kind of what I was also hoping for, that being more info on Kabuto. I complained about the lack of info we got from last week’s chapter considering what should be a long and storied life for Kabuto, so this chapter definitely delivers more on that which is something I am grateful for. As I said, the whole chapter is flashbacks to Kabuto’s backstory, so if you don’t like this type of chapter or if you don’t like Kabuto, then you are probably going to find this pretty boring admittedly. It was pretty interesting though I have to say, as we got to see both Orochimaru and Danzo in their younger days (and working together), plus we found out how Orochimaru first met Kabuto. 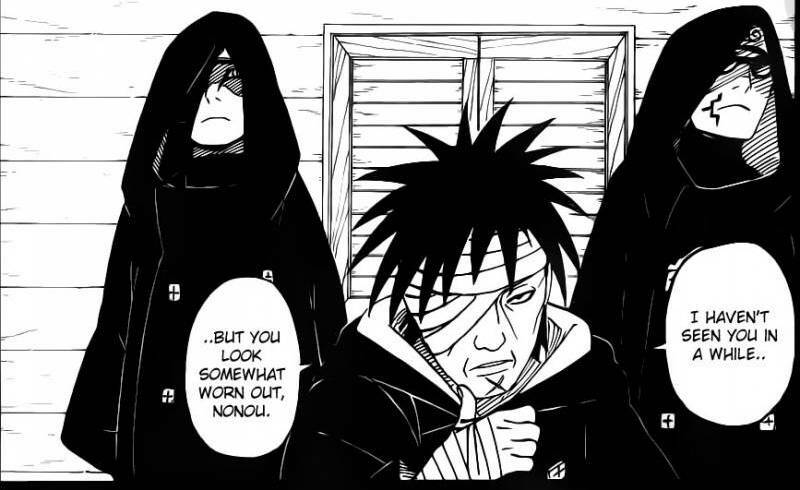 Danzo again showed in this chapter that he was willing to play dirty to get what he wants, with this time him threatening to stop all funding to the orphanage Kabuto was at unless Nonou (Kabuto’s “Mother”) agreed to take part in a very long and risky mission to gather intelligence in the hidden rock village. At first of course Nonou didn’t want to leave the orphanage, and hence why Danzo resorted to the threats. Even after she eventually agreed, Danzo told them that since one of the Root members of his team died in the last mission, he would be taking a child from the orphanage as a replacement. Of course there are objections to that too, but Kabuto is outside and overhears the whole thing, and with Orochimaru’s earlier words about how he would make a good shinobi still clearly resonating inside of him, Kabuto volunteers himself to go so that the orphanage won’t suffer. It goes to show how much Kabuto valued his adopted family and home, as despite having no interest whatsoever in becoming a ninja, he still gave in and volunteered himself just so that the funding for the orphanage wouldn’t be stopped. Oh, also slightly going back a bit, when one of the other people in charge said that there was no way Danzo could stop their funding because they had an agreement with the Third Hokage himself, one of the hooded guys along with Orochimaru made a thinly veiled threat by saying that it would be very easy for a ninja to sneak in and rob the orphanage considering they couldn’t afford to hire a bodyguard / security. It shows just what Danzo and Root were capable of, and that’s why it’s no real surprise to me that Orochimaru once worked alongside Danzo. What really stood out to me though was one panel in particular, where even after Kabuto put glasses on his mother (after she repeatedly asked Kabuto who he was years later when Kabuto was there healing her, but of course didn’t have her glasses on) she still didn’t recognise him. The panel was brilliant, because it genuinely showed the moment where it looked like Kabuto just broke inside. I mean, his whole life was a mystery to him apart from his time at the orphanage and the love and bonds he had developed with her, so when the person he cared about most didn’t even recognise his face anymore, it’s no wonder he apparently snapped / became broken like that. Shortly after that, when Kabuto was looking in to a small puddle of water wondering why his own “mother” didn’t even recognise him and what the point of his existance even was anymore, Orochimaru appeared and told him that he remembers who Kabuto is. Of course I never covered every incident that happened in the chapter, but those were the main focal points in any case. It was really interesting actually having the chance to see Danzo and Orochimaru together like that, as we knew from Tobi’s comments during Sasuke’s fight with Danzo that they had some sort of previous affilliation / relationship. Danzo once again proved that he was willing to do absolutely anything for what he considered to be the greater good, and also how Orochimaru first met Kabuto back when he was a boy, and how years later they met again shortly after the whole incident with Kabuto’s mother. Since it was clear from the start of the chapter that Orochimaru had a strong interest in Kabuto, some people are already speculating that Orochimaru could well have played a hand in the later events too, saying that he may well have put some kind of spell on Kabuto’s mother so she would forget who he was, or even setting up the events leading to her dying. Although nobody can say for sure, it would come as little surprise if it did turn out to be the case considering how little regard Orochimaru has for others, as well as his constant desire to recruit people he sees potential in. But yes, although not a fantastic chapter, I still found it quite enjoyable just for getting to see how Orochimaru and Kabuto met, and also seeing Danzo and Orochimaru together. Next week looks like it could well be another flashback chapter too, and although seeing more of Kabuto’s past would by no means be a bad thing, it is getting a bit tiresome with every single chapter now being complete flashbacks. Decent chapter though overall, and hopefully soon we can move back to happenings and battles in the present.